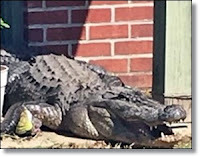 St. Martin Parish, Louisiana - An enormous alligator tried to be the doormat of a home in Louisiana Saturday. St. Martin Parish Sheriff's Office posted photos of the at least 6-foot gator splayed across the front stoop of a home. "So....you never know what may show up on your door step (sic)!" the sheriff's office wrote on Facebook. "Just another day in the life of a St. Martin Parish Sheriff’s Office Patrol Deputy." One of the photos posted by the sheriff's office appears to show the gator vacating its comfortable spot in the shade of the house, but its open mouth suggests it was not happy to be leaving. The sheriff's office provided one last bit of advice in its post: "Always look before you step!"